Note: This game was #2 in the 2010 edition of this list. Halfway through the 3rd quarter, Auburn drove down to the Alabama 29-yard line, but on 3rd down Stan White was sacked for a 6-yard loss. White sustained a knee injury on the play and had to leave the game. However, as if he was the starter himself, Patrick Nix entered the game and on 4th-and-15 from the Alabama 35-yard line, Nix floated a pass to Frank Sanders, who “caught it at the two, and he dives in! Touchdown Auburn! 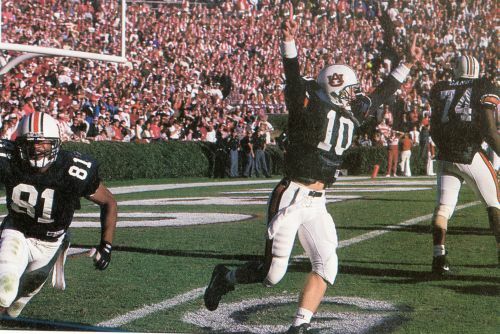 Touchdown Auburn!” Sorry, I had a Fyffe moment. The touchdown brought the score to 14-12. Fun Fact: Due to Auburn’s probation, this game was not televised. However, the game was shown in Bryant-Denny Stadium which made this the only game in history to sell out two stadiums at the same time.